If you are tired of hearing about the royal wedding on Friday, I apologize in advance. You will not be getting a break here. Call me predictable, call me romantic, but there's just too much excitement and inspiration to not discuss. It was only fitting to dedicate this month's super six to Wills and Kate and ways to celebrate their matrimony from your couch early Friday morning (most TV coverage starts around 3am CST). Ahem (insert very British accent), ladies and gentlemen, you are cordially invited to the April (Royal) Super Six. London: One of the first reveals about the wedding was that Fiona Cairns' British bakery would be making the royal wedding cake. From the look of her cute website, the multi-tiered fruitcake with cream and white icing inspired by the Queen's own wedding cake is sure to not disappoint. At $134 per slice, let's hope it tastes as good as it looks. Living Room version: If you're watching the wedding live, you'll probably feel more like Fruit Loops than fruit cake. Make things fun Friday morning, by making these royal fruit cake cupcakes the night before and enjoy them with a spot of Earl Grey tea. If you're like me and not a fan of fruit cake, the blogosphere has plenty of alternatives like these lovely champagne cupcakes with strawberry filling. London: It's just not a British wedding without hats (and fascinators). Hat designer to the stars Philip Treacy will be making many of the headpieces that guests and maybe even Kate will be wearing. SJP is just one of Treacy's famous clients to rock the fascinator. Living Room version: Eugenia Kim shows you how to make your own royal worthy headpiece for under $20 on Daily Candy in this video. It will look fabulous with your pajamas. London: The procession is going to go past all of London's most famous landmarks. The official royal wedding website shows you pretty pictures of all the landmarks on the route. Note: Take a look because seeing the real deal on Friday may be difficult with all of the tall, souvenir Union Jack hats that might be in the way. Living Room version: Follow the route and remember the day with this lovely illustration from The House that Lars Built. It's also available printed on a cute tote. London: Bruce Oldfield announced he's definitely not designing Kate's dress which leaves Sophie Cranston and Sarah Burton from Alexander McQueen. Apparently, there's some money to be made if you can guess the designer correctly. My bets are on Sophie Cranston who designed Kate's velvet number above. Living Room version: If you are planning on hosting a viewing party with your girlfriends, here's your first activity. 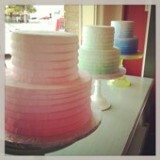 Inspired by the toilet paper wedding dress game played at many a bridal shower, give each guest a roll of toilet paper. After the first glimpse of Catherine's dress, pause the wedding on your DVR and recreate the dress with tp. The girl that gets somewhat close to resembling the look (I use close very loosely) gets more cupcakes. Remember, don't forget to accessorize like Kate will with diamonds, pearls and jewelry borrowed from the Queen. The April issue of Indian Vogue tackles the cultural prejudice of darker skin color in the subcontinent with a cover and article discussing and promoting the skin tone. The editorial states, "Every generation has its share of beauty myths. Perhaps it is time to bust this one. Time to say that as a magazine we love, and have always loved, the gorgeous colour of Indian skin...dark, dusky, bronze, golden-whatever you call it, we love it." As any South Asian gal in the U.S. or abroad can tell you, the quest to be light has been deeply ingrained in the culture while ironically most of her Caucasian friends are running to the spray-on tanning salon. From aunts subtly suggesting the infamous Fair and Lovely fairness cream (Interestingly, the London Times reports that "the demand for skin-whitening creams from brands including L'Oreal..-grew 18 percent last year and is set to increase a predicted 25 percent this year.") to being told to avoid the sun at all costs, the complex bias against the natural skin tone has somehow managed to endure the test of time. So, it's no surprise the cover is getting much coverage in the blogosphere including mentions in New York magazine, the Huffington Post and Fabsugar. British Vogue mentions that the cover "has been praised by the country's fashion insiders for addressing the issue in a positive way" and quotes fashion insider Nirumpama Singh as saying, "Fairness is a very valuable thing there, looked as desirable. The fashion world can be a big agent for change in this area." Looks like the issues is getting some much needed light (yes, terrible pun, I know). So, take that Fair and Lovely, I'm headed outside*. *Remember, always wear sunscreen, regardless of your skin tone. The Official Mobile Spectator Guide iPhone app is a must have for all Winter Olympic fans. With maps, city information and venue information, it is a life saver in an unfamiliar city. For those fans spectators from home, this free app also provides a full Olympic event schedule and up to the minute Olympic results along with pertinent information on all events. Who knew a curling stone weighs 19.1 kilograms? This kid. Despite the fact that this year's Olympics are estimated as the warmest winter Olympics to date (dang Al Gore! ), the damp fog and misty rain rolling in off the ocean are still downright chilly. Funky hats were the biggest fashion trend seen throughout Vancouver, spotted on trendy college co-eds to the Vancougars. The locals definitely know how to look fashionable, while staying warm and dry. Looks like winter will be around for a couple more weeks, so if you're looking to get some new winter wear, I'm loving this Eugenia Kim hat available in a number of chic colors and styles. Or stay au courant like the American athletes with their Ralph Lauren ear-flap hats in this similar hat on sale at Shopbop. Okay, so to say hockey is a new trend may be insulting to some fans, but it does seem trendy to be a hockey fan during the Olympics. While attending the woman's Sweden v. Switzerland Olympic hockey game, I jumped on the bandwagon for Canada's fave sport. The Canadians (men, women and children alike) are crazy hockey fans and I found myself at the most exciting, passionate sporting events that I have ever attended. Riding the Canadian hockey high, I'll be reading this biography on hockey superstar (and Olympic torch lighter) Wayne Gretzky. Going green is certainly no trend at this point, but the city of Vancouver went to extra lengths to host eco-conscious games. All venues were lined with both organic waste and recyclable waste bins and patrons were reminded to dispose of waste accordingly. In an effort to product more eco-friendly public transport, the city is offering free transportation to all Olympic fans. I did my part by carrying a Vera Bradley Market Tote for all of the fun souvenirs I picked up. Check out these cute nylon totes from Baggu if you want to stay on trend. The ox, tiger, and rabbit all agree – it is time for the rat to move along. Today officially marks the end of the year of the rat, as the 2009 Chinese New Year (or lunar Chinese year 4707) introduces the Year of the Ox. It is believed that those born on the year of the ox are dependable, trust worthy and patient. Coincidentally, President Obama was born an ox. With such great strengths tied to those born on the year of the ox, we can’t help but feel anticipation for 2009. The Chinese New Year, the biggest Chinese holiday, lasts for several days and is celebrated throughout the world – often where large Chinese populations exist. Traditionally, during the Chinese New Year, elder members of a family give money wrapped in a red envelope to children, teenagers and young adults. If the likelihood of you receiving a red envelope is looking pretty slim, don’t despair. There are plenty of activities occurring all week that will allow you to partake in the rich traditions of the Chinese New Year. Today, New York’s Chinatown will have their annual Firecracker Ceremony and Cultural festival as well as their New Year’s Parade and Festival on Feb 1. San Francisco’s ChinaTown hosts the Chinese New Year Parade and Festival on Feb 7, a parade that is voted one of the top 10 parades in the world. Also, Vancouver’s ChinaTown will host a parade on Feb 1 as well as a Chinese New Year’s Festival in the Vancouver Chinese Gardens. Those living in the Austin area will be heading over to the recently reviewed Imperia, for their fun Chinese New Year celebration. If going out on the town isn’t really your thing, you can participate in the Chinese New Year from the comfort of your own home. Invite some of your pals over and cook up an Asian inspired meal in honor of the Year of the Ox. Food and Wine magazine has put together a list of their top 10 Chinese recipes, that are sure to impress like the tofu dumplings and peppercorn shrimp pictured above. Whether you flock to the streets to participate in the Chinese New Year parades or simply savor a fortune cookie this week, we hope the Year of the Ox inspires you to hope for something great in 2009. 4) No doubt President Obama's inaugural address will be one for the history books. Brush up on famous past inaugural quotes with this quiz. Proceed to be a presidential smarty pants all day Tuesday by spouting off quotes left and right. 3) The inauguration has a number of companies feeling generous which bodes well for us. Have a free donut from Krispie Kreme on Tuesday or 44 cent clam chowder from Legal Seafood. Or simply mark the transition with Bliss Spa's Farewell to Bush bikini wax special. So deviously clever, we had to pass it on. 2) It's not too late to throw a last minute inauguration party. Serve some of the newly elected president's favorite foods along with some red, white and blue cocktails. While all eyes will be glued to the tv, make things extra exciting with some some Obama Bingo. 1) Tuesday is certainly not all about Mr. Obama. The big question on every fashionista's mind is what will Michelle wear? Fashion insiders are buzzing over her possible selection for the ball, with many betting on a young American designer like Thakoon or Jason Wu. While the designer of the gown and the gown itself will not be revealed until the day of, take a look at what the fashion world's best designers envisioned for the First Lady. All fashion fun aside, one can't easily forget Michelle Obama will definitely be more than just a fashion icon; so take some time to mark the Inauguration on this Martin Luther King day to answer her call to service. Time magazine's Pop Chart probably put it best: "Vogue India photo shoot puts pricey accessories on impoverished people. American Vogue still putting pricey accessories on malnourished people." Snarky. And comments like that are just the tip of the iceberg surrounding the latest fashion debate. The Vogue India editorial spread in the recent issue stirred up quite the controversy last week. The photo spread featured luxury items like a Burberry umbrella, a Fendi bib and a Hermes Birkin bag. Items that are not terribly shocking to see in a Vogue shoot. However, what has the media buzzing was the combination of such high end products with impoverished unnamed citizens. A woman carrying a young poverty stricken child wearing a $200 Fendi bib. A poor family piled onto a moped driven by the tired mother sporting a Birkin bag. A toothless, barefoot man (referred to as just "man" in the magazine) holding a Burberry umbrella. A bold statement combining some of the world's poorest people with some of the most expensive fashion items. But did it takes thing too far? Depends on who you ask. Critics call it exploitation of the poor and simply poor marketing. Many Indians survive well below the poverty line at less than $1.25 a day, causing newspaper columnists like Kanika Gahlaut to refer to the layout as "not just tacky but downright distasteful." She adds that using a rural mud hut as a backdrop for Burberry and Alexander McQueen accessories was not "fun or funny" when hundreds of Indian farmers commit suicide every year as a result of failed crops and debts. Other critics like Pavan K. Varma, author of The Great Indian Middle Class says with the emerging wealthy in the subcontinent, those with money who are readers of the Vogue India, are becoming blind to poverty. He says, "To use people like this shows a complete callousness to genuine suffering. These people have been used as commodities to sell fashion." Vogue India's response to the critics has been to "lighten up". Editor Priya Tanna replied with her controversial statement, "You have to remember with fashion, you can't take it that seriously. We weren't trying to make a political statement or save the world." She also referred to the issue as a way to "showcase beautiful objects of fashion in an interesting and engaging context" and that "fashion is no longer a rich man's privilege. Anyone can carry it off and make it look beautiful." The magazine also stated that "models' were paid a significant amount. We doubt it was enough to afford the Burberry umbrella. And others like fashion designer David Abraham have come to the glossy mag's defense stating that "wealth next to poverty is just a reality in India." And editorials in defense of Vogue have pointed out that the photos simply point out the poverty issues that exist as India becomes a huge market for high fashion. What do you think? Do you agree with Vogue India's editor that its just fashion and critics need to lighten up? Or did the magazine and editor take things too far with exploiting the poor? Like most of the television watching world, we have Olympic fever and we have it bad. Usual runway fashion talk now consists of China's gymnast attire and the daily read of Popsugar has been replaced with Yahoo!Sports. Just call us Olympic fans. So while you can get the real action on NBC, we wanted to salute the loyal fans (who you may not be familiar with) of our favorite gold medal winners. As of Wednesday, Olympic swimmer Michael Phelps has a whopping 11 gold medals under his belt and is not showing any signs of slowing down. For those of you that may have been living under a rock, Mike is on his way to breaking the record for the most gold medals won at a single Olympic event. While the international superstar's fan base is growing exponentially with each new win (he averages 83 new fans per minute on his Facebook page), his most loyal fan is back in the U.S....waiting for his walk. If Phelps is the media darling of these Olympic games, his pet bulldog Herman (featured in his very own NBC commercial above) takes the silver medal. How incredibly adorable do they look sprawled out on the couch watching TV? It is a pretty safe bet that win or lose, Herman is anxiously awaiting his best friend's return to the U.S. Forget the gold medals and million dollar endorsements, with an owner that requires a daily 8000 calorie diet, the table scraps alone are pure gold. Sure, most of us had no idea that the 10m air rifle shoot, was an Olympic event. But for the medal-starved nation of India, the rifle shot never sounded sweeter. Ecstatic India has been celebrating Bindra's gold medal, making it the country's first individual event win. While his father may have flipped the bill for the training for the expensive sport, we absolutely adore Momma Bindra's quote that has made it into most major news stories about the Olympic champion. She says, "Yes, I have already started the search for a bride, as he is the most eligible bachelor in the country now." Just like a mom to look out for her baby. This was Bindra's third Olympics and he was considered quite the underdog entering the competition. It's doubtful Mrs. Bindra will be including that info in her son's matrimonial. Veteran Chinese gymnast Yang Wei clenched the gold after his stellar performance on Wednesday in the individual all-around event. This is in addition to leading his team to the gold medal in the team competition. So it's shocking to think that four years ago he was considering retiring and giving it all up due to his age. The gymnast is 28 years old, considered ancient in the sport. However, according to media reports, it was Yang Yun, once a national gymnast herself winning bronze at the Sydney Olympics, that convinced him to return to the team instead of retiring. The Chinese media reports that according to him, at events like the World Championships, his fiancee has sent motivational text messages that have given him that extra confidence. At other meets, seeing Yang Yun has kept him from being distracted on the difficult pommel horse. Wei says, "As soul-mates, we can read each other's minds without uttering a word." Can we just get a gigantic "awwwwh"? So, it's no surprise, it was his soul-mate that convinced him to stick with the sport he excels at. The result: this week's golden victories. Guess it's true: behind every good gymnast, is a good female gymnast. What can we say? We flip for a good love story. Years from now, when future generations look back at the great presidential election of 2008, will they recall the proposed energy plans? The great health care debate? It's likely, even the economic woe solutions will barely be remembered. But odds are, the "My mama's for Obama!" t-shirt will live on. Or maybe the "Mac is back" shirt will fondly be found in a vintage store. And its no wonder, because as the election heats up, the fun shirts just keep rolling out. T-shirt mega websites like Cafepress and Zazzle have hundreds of creative wearables to express your candidate's endorsement. Tell the world "McCain is my homeboy". Democrat? There's the "I rock with Barack" shirt or the "Da Bama!" design with a tasteful sketch of the presidential-hopeful's head. McCain supporters will not be disappointed either. Proudly wear your "McCainic" shirt or the "Use your brain, vote for McCain" tee. And in all fairness, after Paris' video comeback, there's the overexposed but one must admit slightly funny:"Vote Paris for President, not that white-haired dude.". As expected, the shirt comes in pink. While we have to wait a few months to see if her husband will win, Michelle Obama is winning when it comes to style. The First Lady hopeful is at the top of the recently announced 2008 Vanity Fair's International Best Dressed List. The magazine notes her Mario Pinto dress worn when her hubby grabbed the Democratic presidential nomination and of course, the very famous Donna Ricco dress Obama wore on the The View. The dress, from White House/Black Market which retails for $148 has been selling faster than you can say Barack and is quite the talk of the fashion circuit. It is a highlight of my magazine browsing summer when VF's international best dressed list is revealed and this year's poll results are interesting. Ivanka with her elegant style makes the cut along with Carla Bruni-Sarkozy (French first lady) who is featured on the cover. Without spoiling it too much, there's also SJP ("Because she made Blahnik iconic"), a personal fave, Matt Lauer, the Clemente brothers and the uber chic Carine Roitfeld (French Vogue Editor-in-chief). While the list does have it's share of controversy, (i.e. the New York Times blog humorously deemed it the "International Brown-Nose List"), it's still a treat to swoon over. The magazine will be on newsstands in New York and earthquake stricken LA on July 30 and the rest of the country by early August. With the presidential campaign in full swing, many pet owners are noticing an increase in political discord amongst their furry friends. My own household appears to accommodate canines from opposite ends of the political spectrum. Issue--immigration. While one of my dogs passionately defends the borders of our land, the other frantically digs holes under the fences as if to say, "Come on in. We'll take you. Heck, I'll even dig you a path." Those looking to give their dogs a political voice outside of dirty campaign commercials (cue grainy black and white film of a paw shaking while the narrator asks, "Who will be protecting your family when the call comes? Not the puppy! She is either sleeping or eating up the dining room table.") should consider Psychedelic Fur Political Doggy Tees. 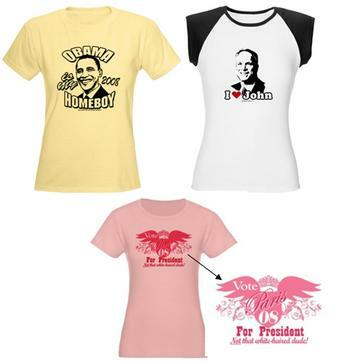 These political tees, featured on Outblush, allow your pets a voice in the political process. 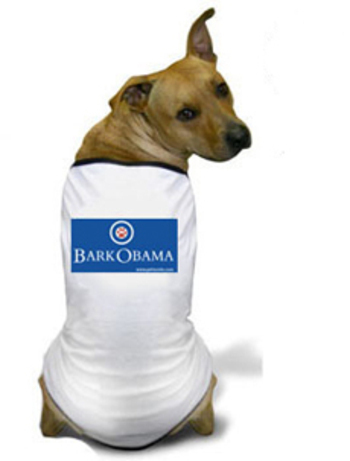 They can show off their support for Bark Obama or be more conservative and proudly wear their McCanine shirt. The shirts are available in a variety of sizes and a portion of all proceeds benefit the North Shore American League America.